Ralph Lauren (born Ralph Lifshitz) is an iconic American fashion designer, philanthropist and best known for the Ralph Lauren Corporation, a global multibillion-dollar enterprise. Lauren was born in the Bronx (New York City) on October 14, 1939, to Frieda and Frank Lifshitz. His parents were Ashkenazi Jewish immigrants from Pinsk, Belarus and the Lifshitz family lived an average middle class lifestyle. While growing up in New York, Lauren attended Marsha Stern Talmudical Academy (Orthodox Jewish day school aka Yeshiva) and DeWitt Clinton High School. He was known for his distinctive fashion sense as a teenager and would always strive for a better life. In high school he started selling ties to his classmates. “Those ties were handmade, by the way,” Lauren says proudly. “Back then, ties, even designer ones, didn’t sell for more than $5 a piece. Mine were $12 to $15. Such luxury in something so simple was revolutionary.” It was not long before Lauren had established a reputation for himself. The fashion icon is also a philanthropist. “The Polo Ralph Lauren Foundation” supports initiatives in cancer care, education and services in underserved communities. Lauren engages in a number of philanthropic initiatives.” These initiatives include: The Pink Pony Campaign (provides proceeds to a worldwide initiate in the fight against cancer), American Heroes Fund (provides college scholarships for children of victim of the tragic 9/11 events), the American Jewish Committee (Jewish advocacy organization) and so many more. It is evident that Lauren tries his best to do his part in helping the world and his fellow Jews. Lauren says he is proud of his Jewish heritage and celebrates the Jewish holidays. 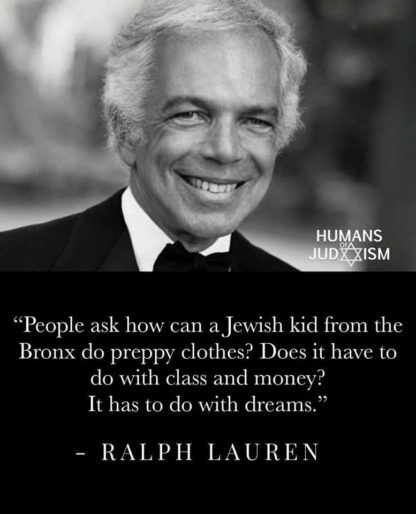 Rumor has it that Ralph Lauren was at the Western Wall wearing Tefillin. Some speculate that it is his brother, but either way lets give it up for the Lauren family showing their Jewish pride.